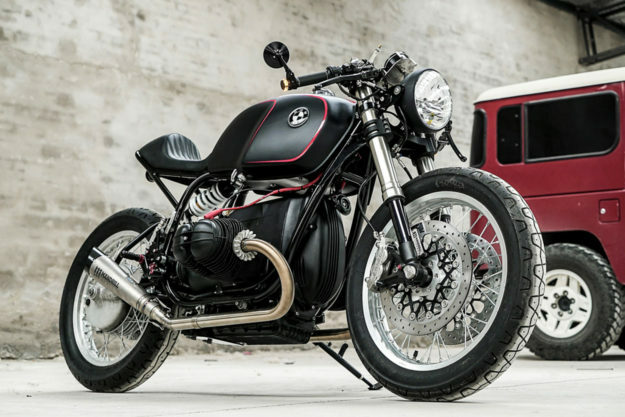 BMW R90 by Mandrill Garage China Isn’t exactly a hotbed of custom motorcycle activity, but with shops like Mandrill Garage building bikes like this, there’s hope. 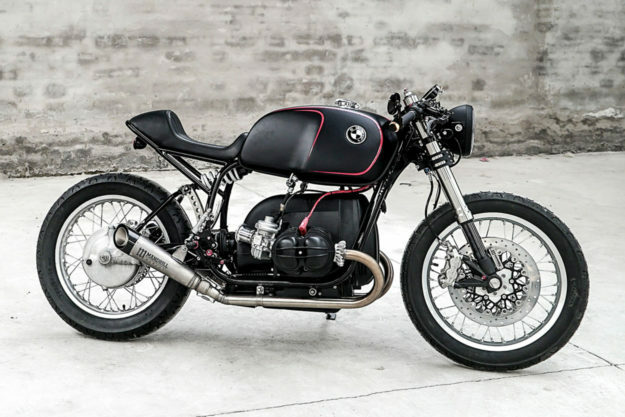 Based in Beijing, Mandrill was founded about five years ago by four friends as a side project, and has grown steadily with builds like this 1976 BMW R90/6. 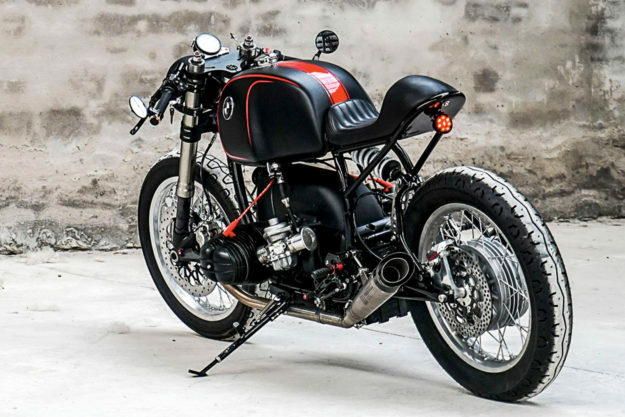 The bike came to Mandrill via a collector (classic BMWs are as rare in Beijing as you’d expect) who wanted it transformed into a stylish cafe racer. With Chinese law forbidding motorcycles older than eleven years from being ridden on the street, the R90 had stood for years, so a full refresh of all the internals was in order. 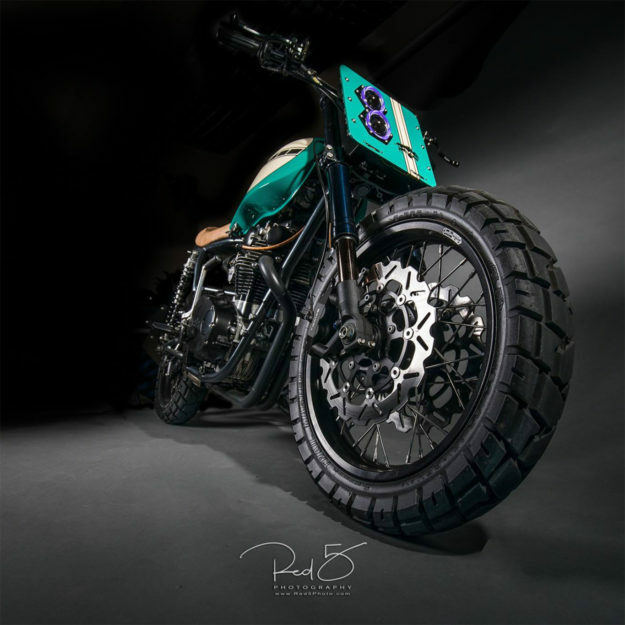 The carbs were refurbished and fitted with velocity stacks, and a custom-made twin exhaust system made up with titanium mufflers and carbon fiber tips. 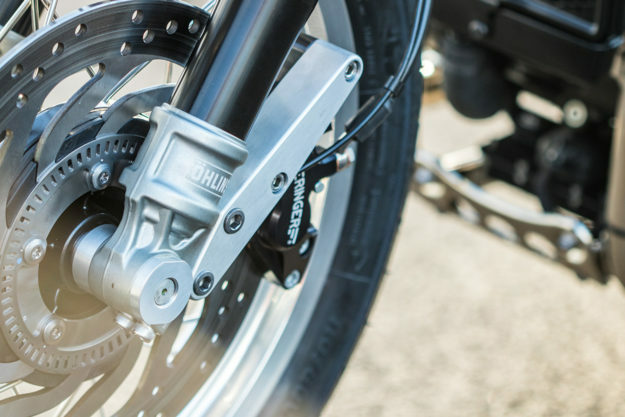 Mandrill have done well to modernize the old boxer, with a set of Ducati 1098 forks and brakes up front, and a custom-built mono-shock setup out back. The new rear end is pretty compact, thanks to a custom subframe and cafe-style seat. Tasty bits are sprinkled throughout—like one-off triple clamps, a Brembo rear caliper, lightweight rear-sets and CNC-milled switchgear from Renard Speed Shop over in Estonia. The guys rewired the bike too, treating it to a healthy portion of Motogadget-ry. Yamaha XS650 by Tyson Carver We spoke just the other day about motorcycles as a form of therapy. For twin brothers Eli and Tyson Carver, getting into riding helped them cope with losing both of their parents two months apart, about six years ago. Riding soon turned into wrenching, with each taking on various custom projects. 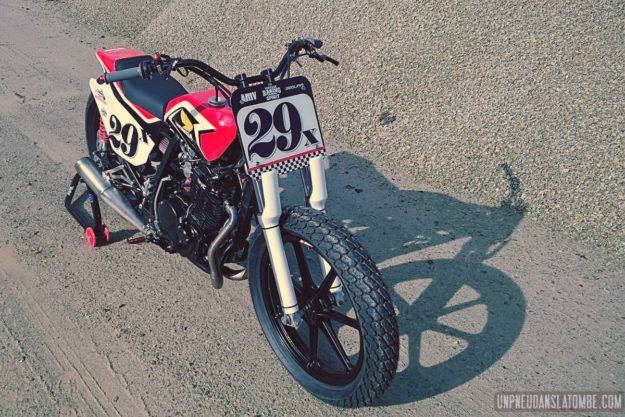 This sweet Yamaha XS650 tracker is Tyson’s latest. It started out as a 1975 XS650, but the frame’s really the only part of the original bike that’s left. There’s a 1980-model motor wedged in there now, with a NOS Yamaha factory 750cc big bore kit inside, courtesy of Chris at Limey Bikes. The upside-down forks are from a 2008 Suzuki GSX-R, and the wheels are 18” rims laced up using Cognito Moto parts. The rear loop is another Cognito item—Tyson turned to his friend Tanner to help him weld it in, along with the electrics pan under the seat. Then he stretched out the swingarm by 2” and bumped up the height with new shocks. The seat pan was made from fiberglass, but it’s the new faceplate that Tyson’s really proud of (in fact, the design of the faceplate inspired the rest of the bike). To build it, Tyson made a model from foam board, then a friend drew it up for him in CAD so that it could be cut to spec from aluminum. 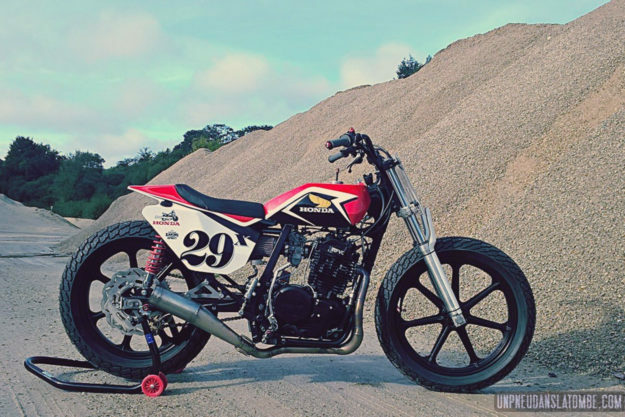 Honda XL 600 RM by Breizh Coast Kustoms Even though BCK’s Yann Le Douche had just built and raced a perfectly good Harley hooligan tracker, he found himself back in the workshop in no time. You see, Yann was planning to enter local French races organized by Vintage Racing Spirit, but the rulebook stipulated a maximum displacement of 750cc. 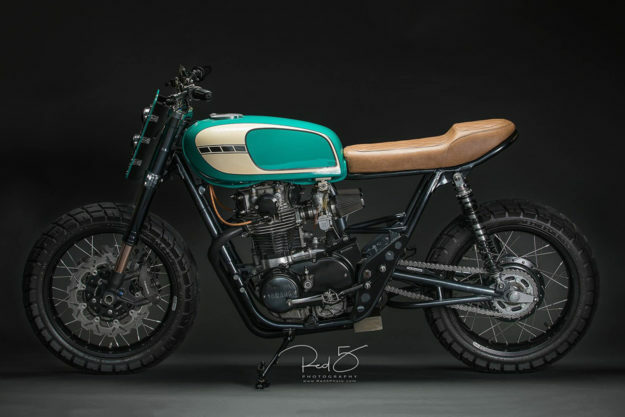 A 1987 Honda XL 600 RM stashed in the corner turned out to be the perfect donor. Yann’s ultimate goal was to shed as much weight as possible, so he started by swapping the electric start motor for a kickstart-only 1985 power plant. That meant he could also ditch the battery and a whole lot of wiring. And he’s named it the ‘Bone Destroyer,’ because, as we all know, old thumpers have a nasty habit of kicking back. 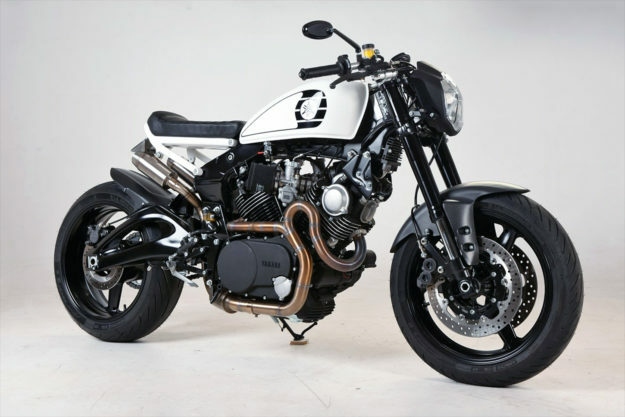 Custom Yamaha XV1000 by Pacific Motorcycle Co. The custom scene in New Zealand is small. The country is bike-mad, but most of those bikes are vintage, or race bikes, or ADVs. If you’ve watched The Lord Of The Rings films, you won’t be surprised to know that the Land Of The Long White Cloud is GS and V-Strom territory, and the riding demographic is both wizened and bearded. 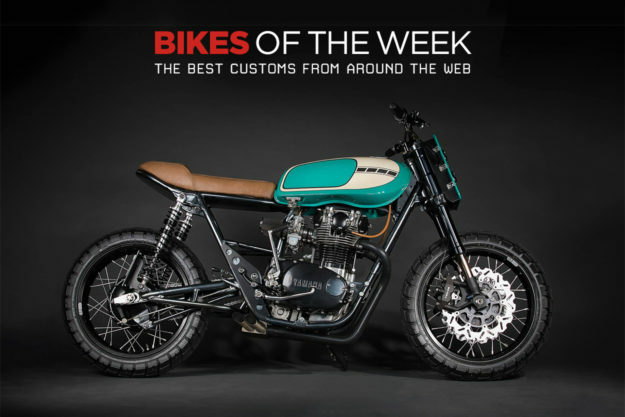 The Pacific Motorcycle Co. is one of a tiny handful of Kiwi shops carrying the custom flame, and very nice work they do too. They’re based in Nelson, the oldest city in New Zealand’s south island, and a place surrounded by fine riding roads. Taking this XV1000 out for a spin around the famous Abel Tasman national park would be a blast. 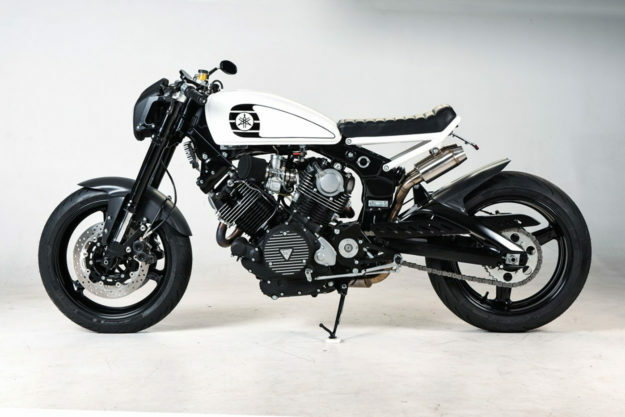 Maximum torque from the completely rebuilt Virago V-twin comes in at around 3000 rpm, and the lads at Pacific have fixed the XV1000’s main bugbear—the vague handling. The forks are from a Yamaha R1, the swingarm is from an R6, and there are powerful Tokico brakes up front. The pseudo-cruiser tank has been swapped out for a modified Honda CX500 item, and resting on the custom rear subframe is a simple flat seat unit to replace the (frankly hideous) 1970s chopper-style stepped seat of the original. 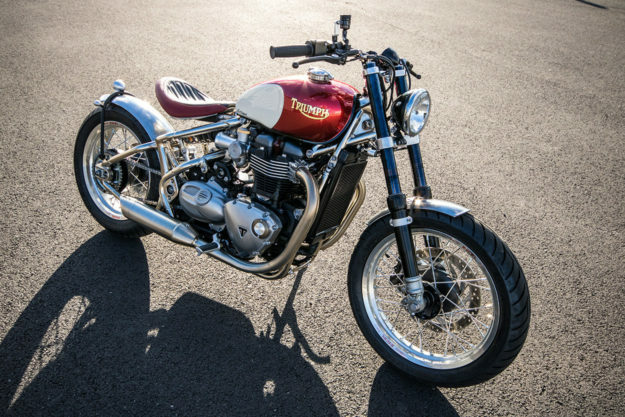 Triumph Bonneville Bobber by FCR Original Matt, Chris and I have pretty strong opinions on just about everything, but on one thing we all agree: the Triumph Bonneville Bobber is hot stuff. It’s one of those rare factory bikes where every last detail is amazing, so it’s hard to improve upon. At least we thought so, until the French outfit FCR Original got their hands on one. 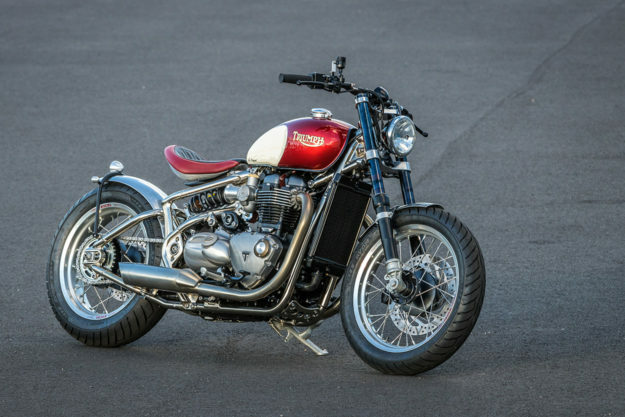 At a glance, this Bobber’s silhouette seems indistinguishable from the stock bike—but there are a lot of subtle changes that elevate it beyond the norm. For starters, FCR stripped the bike down before nickel-plating the frame and swingarm. The all-black front forks are from Öhlins—held in place by FCR triples—and the rims are matching 18” items from Excel. There’s a set of LSL bars up top, a Beringer brake caliper up front and custom fenders and braces at both ends. The plastic side covers are gone, and the stock silencers have been cut down. FCR also swopped the speedo for a Motogadget unit, which meant employing some electrical wizardry to circumvent the modern Triumph’s system.